A few days ago I came across this story on the BBC about some long-lost letters from Frederic Chopin that kicked off a series of brain flares. Six letters written by Frederic Chopin, thought to be lost in 1939, have been found and donated to a Warsaw museum dedicated to the Polish composer. There’s a bit of family humor that came to mind immediately, as I have a step-nephew whose birth took my father in a literary direction … as was often his angle. Born to my Chinese sister, Debbie, and her Japanese husband, Dad decided the kids needed a nickname. What came to mind were a couple of James Clavell novels … Shogun and Tai-Pan, one being set in Japan, the other in China. He called the boy “Taigun”, because, as he said, “Sho-pan” wouldn’t work because he was Polish. 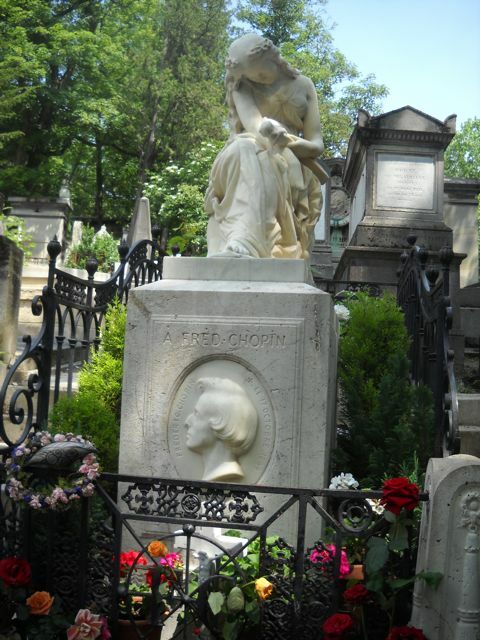 From there I jumped to Paris where I shot the photo you see here at the grave of the real Chopin on a day I solitarily rambled the Pére Lachaise Cemetery in the company of my son’s spirit on the first anniversary of his death … Jaren’s, not Chopin’s. So it was the second of June last year I sat for a time at Chopin’s grave. Listening in my head to his “Nocturn”, I contemplated the accomplishments of his mere 39 years of life and, in keeping with my situation at that moment, his doomed relationship with the writer George Sand and the heartbreak that virtually ended his days as a composer … and as a man among the living. His grave is lovely, a peaceful, perpetually flower-strewn resting place reminding all of not only the music, but also the passionate transplanted Pole amongst Parisians … his heart, by the way, rests in Poland at his wish it be removed upon his death and buried there … the complicated lover to a complicated woman. As often is the case with artists, neither Chopin nor Sand were easy and their relationship was unconventional. She was an older woman with strong passions of her own and a long string of relationships. He was physically weak and needed such babying she referred to him often as her “third child” and a “beloved little corpse”. That they lived and loved and died is history, as everything eventually becomes. Their lives were what they were, and 162 years after his death he fills me with music and sets me to pondering the bumpy, uncomfortable roads traveled and the resulting detritus of our journeys. The news that letters have been found feels almost like a gift from that grave I visited, and I’m more than pleased that email wasn’t an option in those years between 1845 and 1848 when he wrote them.